So you want to improve your kitchen. Maybe you plan to open some walls and reconfigure the space. Or maybe you’re seeking to freshen up an outdated space. Perhaps you already have a mental picture of your dream kitchen. But have you given much thought to your cabinets? They’re easy to take for granted, yet they’re one of the most apparent and foundational components in your new room. Many a kitchen designer selects cabinets from big-box producers, which manufacture standard units and shapes. But John Kruschke approaches cabinets from a different perspective. The owner of Premier Woodwork, 1522 Seventh St., in Rockford, leads a team of 15 craftsmen who can produce, by hand, the same components and contraptions offered by the big-box producers. Not only are these cabinets made locally, but they’re made with quality craftsmanship and built to fit precisely. Custom cabinets allow homeowners to get exactly what they want in shapes, sizes, colors and trims. The customizability is an advantage when fixing up older homes, where space may be limited or awkward. 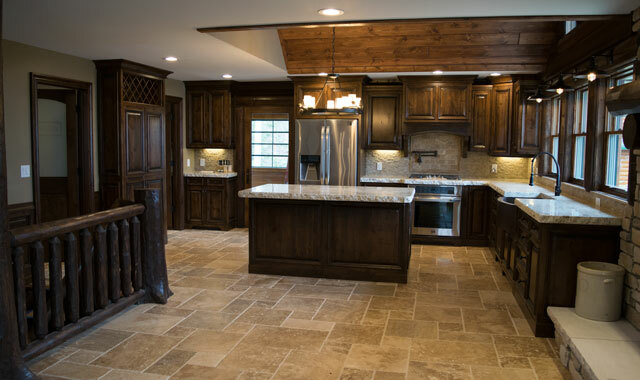 Kruschke’s specialty is cabinetry, so it’s not unusual for him to work in coordination with a dedicated kitchen designer who can tie together the new cabinets with paint colors, countertops, flooring and light fixtures. Those designers also can help Kruschke to identify a working floor plan and appropriate sizes for cabinets. Whether working with a designer or directly with a cabinet builder, homeowners should be prepared with photographs of kitchens they like. Some of Kruschke’s first questions center around visuals. Lately, Kruschke has seen a trend toward darker cabinet colors and the return of an espresso finish. The classic white cabinet remains a timeless choice, though it’s received a touch of modern chic. When Kruschke says cabinets are fully customizable, he means it. His office and the hallway outside are filled with samples: boards filled with molding choices and sample cabinet doors leaning against a wall. Samples of baseboard and trim options mix with kitchen designs on his desk. Little accents provide a subtle, yet powerful accent. It’s the little details that make a big difference in quality, too. Gadgets and hardware are making their way into more and more locations in kitchen cabinets. Virtually anything you’ll find in a large-scale cabinet manufacturer Kruschke can install in a custom cabinet. Tools like soft-close cabinets are old news. Technology is integrating itself into the kitchen in new ways, and custom cabinetmakers can adjust accordingly. One of Kruschke’s new tricks, useful in kitchens or in family room entertainment hubs, is the pop-up TV. “You put the TV in a base cabinet and the facing is false. It just looks like cabinetry,” says Kruschke. “The lid pops up from the countertop and raises up to reveal the TV. Then, it goes back down again. We can use a remote control. It’s pretty slick. The team at Premier Woodwork is used to doing high-end woodwork for settings like banks and hospitals, so it’s easy to create a wet bar and other accents that class up the basement. The real estate market may be picking up, but that’s not stopping homeowners from investing in things like custom cabinetry. The team at Premier Woodwork is keeping busy with new residential projects. In fact, business is so good that Kruschke is expanding the operation into a 15,000 square-foot space next door. Custom cabinet creation can take about eight weeks from design to fabrication. Of course, that timeline also depends on the design work and any changes the client might make along the way. Be prepared for unexpected delays that might pop up. “Sometimes when they start doing demolition on an older home, they find things they didn’t realize were there, and we have to make changes accordingly,” says Kruschke. Custom cabinetry typically costs more than pre-sized manufactured cabinets. But it’s the quality craftsmanship, made by local, rather than foreign, craftsmen, that sets this option apart. Not to mention, they can add most any gadget or accent, because, when you make it yourself, you have unlimited possibilities. This entry was posted on Friday, July 29th, 2016 at 11:58 am	and is filed under Home & Garden. You can follow any responses to this entry through the RSS 2.0 feed. Both comments and pings are currently closed.